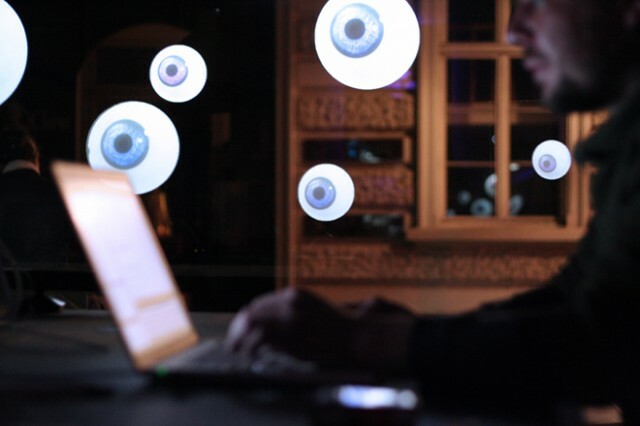 “All Eyes On You” is an installation created by Britzpetermann, a creative studio for interactive experiences. The piece is made up of a bunch of various eyeballs that follow you as you pass by. This project is powered by Arduino, a very popular open-source electronics prototyping platform based on flexible, easy-to-use hardware and software. It’s intended for artists, designers, hobbyists, and anyone else interested in creating interactive objects or environments. “All Eyes On You” is reminiscent of many Arduino projects, including this one, which automatically closes a window whenever a train is detected. The team used a high quality projector and semi-matt foil to project the eyes on the window. They are rendered by a WebGL frontend using a shader sphere effect. The detection is performed by OpenFrameworks and the Kinect. An Arduino controlled servo motor, pushing a button on the projector remote, is turning the installation on at 4pm and off at 11pm. You can check out tons of other great projects utilizing openFrameworks, an open-source C++ toolkit for creative coding (used in this project for movement detection), in the official gallery. Have you seen any other awesome Arduino or openFrameworks projects? Let us know in the comments below!